Posted on 11, December 2018 by EuropaWire PR Editors | This entry was posted in Business, Germany, Investment, Management and tagged Aurubis AG, dividend, Financial, investors, shareholders. Bookmark the permalink. HAMBURG, 11-Dec-2018 — /EuropaWire/ — The Executive Board and Supervisory Board of Aurubis AG (Aurubis) will recommend a dividend of € 1.55 per share at the Annual General Meeting on February 28, 2019. This resolution was passed at the company’s Supervisory Board meeting yesterday. If the shareholders at the Annual General Meeting accept this recommendation, the payout ratio will be 26 % (previous year: 28 %) of the operating consolidated net result. The dividend yield based on the Xetra closing price of € 60.24 for Aurubis shares as at September 28, 2018 amounts to 2.6 % (previous year: 2.1 %). Aurubis closed fiscal year 2017/18 with a very good operating result of € 329 million (previous year: € 298 million). Operating return on capital employed (ROCE) was 14.8 % (previous year: 15.1 %). The multi-metal company therefore fulfilled its forecast, which it had increased at the fiscal half-year mark. A higher concentrate throughput due to a good performance at the Hamburg and Pirdop (Bulgaria) sites positively influenced the result. The prior-year result had been strained by a scheduled maintenance shutdown in Q1 2016/17. The 2017/18 result was also supported by substantially higher refining charges for copper scrap with good availability, higher sulfuric acid revenues due to considerably higher sales prices, and a higher metal gain with increased copper prices. The sales markets also developed positively: Aurubis boosted sales of rod, shapes, and flat rolled products in the past fiscal year. The efficiency improvement program once again accounted for positive contributions to the good result, achieving the target of an additional € 30 million in project success in fiscal year 2017/18. The US dollar, which was weaker overall during the reporting period, and unscheduled maintenance shutdowns at the Hamburg and Pirdop sites shortly before the close of the fiscal year had negative impacts on results. 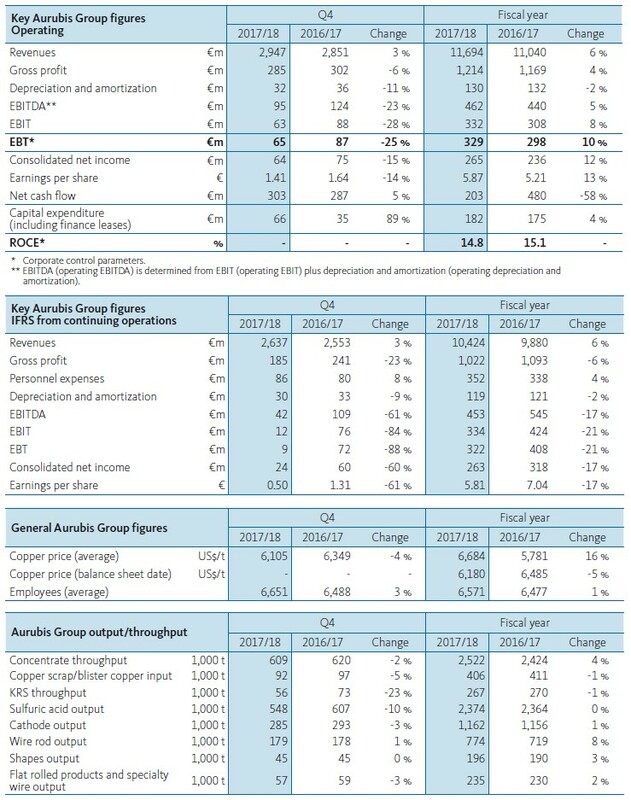 IFRS consolidated earnings before taxes (EBT) from continuing operations totaled € 322 million in fiscal year 2017/18 (previous year: € 408 million). Due to the intended sale of Segment Flat Rolled Products, which is subject to approval by the antitrust authorities, Aurubis is presenting this segment as discontinued operations in accordance with IFRS 5 in its annual financial statements. Because the IFRS result includes measurement effects due to copper price fluctuations and other factors, Aurubis discloses an operating result that differs from the IFRS result. The operating result eliminates these effects, enables a more realistic assessment of the business performance, and is therefore the decisive parameter for managing the company. This reporting of the operating result is not affected by the sale of Segment Flat Rolled Products. For the current fiscal year, the company anticipates that operating EBT will be moderately lower than that of the past year. Aurubis expects ROCE to be slightly below prior-year level. This forecast is affected by multiple unscheduled maintenance shutdowns at the Hamburg, Pirdop, and Lünen sites that have had a negative impact of € 25 million on fiscal year 2018/19. Likewise, according to the company’s current plans, additional scheduled, legally mandatory shutdowns in Lünen and Pirdop will have an impact of around € 20 million. Nevertheless, industry forecasts continue to point to a good market environment overall, as well as stable copper demand. Aurubis set its copper premium at US$ 96 (previous year: US$ 86). Spot prices for concentrate treatment charges are above the current benchmark at the moment. The market trend for copper scrap and sulfuric acid in fiscal year 2018/19 continues to be difficult to forecast due to the short-term nature of the business. The Supervisory Board of Aurubis AG passed a resolution in its meeting yesterday that Executive Board Chairman Jürgen Schachler will leave the company when his contract expires on June 30, 2019. Under Jürgen Schachler’s leadership, the Aurubis Group took significant steps to sustainably secure its success and to enable continued growth. These include the advancement of the Vision 2025 and the strategy deriving from it, which sees Aurubis consistently developing into a multi-metal supplier. With the FCM (Future Complex Metallurgy) project, Aurubis initiated one of the largest individual investments (volume: about € 320 million) in the company’s history. Thanks to FCM, Aurubis will expand its possibilities for processing raw materials, shortening throughput times for precious metals, and reducing capacity bottlenecks at the Hamburg site. After the construction and start-up phase, the project is expected to generate a contribution to earnings (EBITDA) of approximately € 80 million per year beginning in fiscal year 2022/23. Additional measures, such as the efficiency improvement program and AOS (Aurubis Operating System), demonstrate the expected successes in earnings improvement and will have a gradual impact in the coming years. Aurubis AG is a leading worldwide provider of non-ferrous metals and the largest copper recycler worldwide. The company processes complex metal concentrates, scrap metals and metal-bearing recycling materials into metals of the highest quality. Its main area of expertise is the processing and optimal recovery of concentrates and of recycling raw materials with complex qualities. With its range of services, Aurubis is a forerunner in the industry. The group of companies is oriented towards growth, efficiency and sustainability: The main components of the strategy are the expansion of the leading market position as an integrated copper producer, entering new markets in the area of industries of the future, the highly efficient and optimal production of additional metals and by-products from complex raw materials, as well as practicing a responsible attitude when dealing with people, resources and the environment. Aurubis produces more than 1 million t of copper cathodes annually and from them a variety of copper products such as wire rod, continuous cast shapes, rolled products and strips, as well as specialty wire and copper profiles and alloys. Precious metals, selenium, lead, nickel and a series of other products such as sulfuric acid and iron silicate also belong to the product portfolio. Aurubis has about 6,500 employees, production sites in Europe and the USA and an extensive service and sales system in Europe, Asia and North America. Aurubis’ customers include companies in the copper semis industry, the electrical engineering, electronics and chemical industries, as well as suppliers of the renewable energies, construction and automotive sectors. Aurubis shares are part of the Prime Standard Segment of the German Stock Exchange and are listed in the MDAX, the Global Challenges Index (GCX) and the STOXX Europe 600.